The Aponjon counseling line is now available round the clock. The service which is only a few months old has now further enhanced its features by expanding the service into 3 shifts with more doctors. Subscribers can now call any time of the day to 16227 and talk to the doctors about their problems. Previously available from early morning till 10 AM at night, the service became available 24x7 from mid-October. This new dimension of Aponjon service allows any subscribers all around the country to seek professional advice and counseling any time of the day and increases the satisfaction level in the service. Counseling with doctors had been a popular demand from the Aponjon subscribers. In 2012, the formative research done by Aponjon had shown that the subscribers had a great demand to be able to talk directly to a doctor over phone, so that they can get solutions to health problems of their infants and themselves. Aponjon has taken the demand into account and the subscribers’ wish has been transformed into a new service altogether; The Aponjon Counseling Line. Aponjon Counseling Line is an extended service from the Aponjon Call Center by dialing 16227. The service is reachable from the mobile phones of the mothers and the family members registered and currently active in the service. Since the beginning, Aponjon has been a one way communication of health information to the mothers and the gatekeepers. Now, they can also talk to the Aponjon counseling line by dialing 16227 from any mobile phone and press 2 to get to the doctors. The service is manned by doctors specialized into maternal and child health, so that they can suggest Aponjon clients regarding any problems that they or their infant may be having. Other than providing counseling on medical and other issues related to pregnancy and infant health, Aponjon counseling line also guides the caller by referring them to an appropriate specialist or medical facility so that they can get advanced care. Aponjon Counseling Line also features a follow-up system by doctors to ensure proper compliance of the patient with treatment/advice. 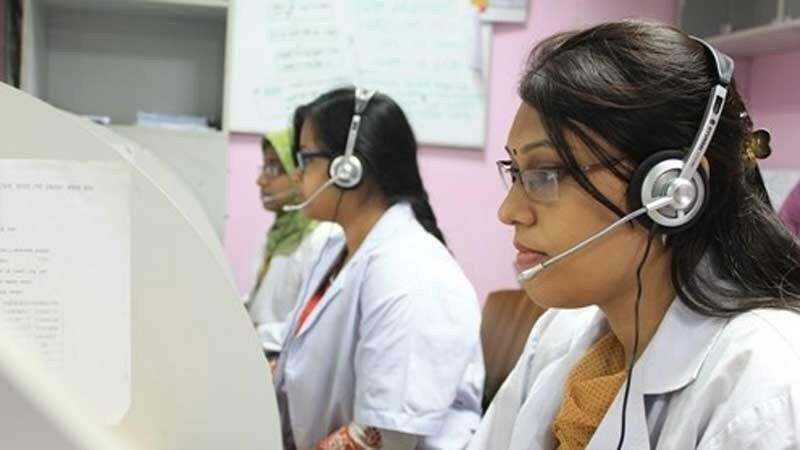 The service costs Taka 2.37 per minute (including VAT) at 10 second pulse, which, yet again, is the lowest cost medical VAS service available in Bangladesh.